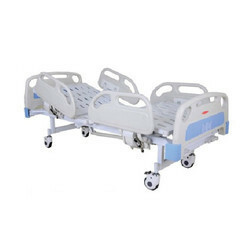 Manufacturer of a wide range of products which include fowler bed with abs siderails and semi fowler bed with ss bows. 4 Section perforated CRCA sheet top. Backrest and Kneerest operated by screw lever mechanism with 2 separate cranks. Removable PP mounded head & foot ends. Legs fitted with 125mm dia. synthetic castor wheels. Four location for IV pole provision. 60mm x 30mm CR tubular frame work. 4 locations for IV rod provision. Castors of 4, two with brake. Looking for Fowler Bed ?